In Tesshi-e's plinky-plonky-soundtrack'd escape game Escape from the Knight Room, you're just looking to take it easy when you get a note from your old friend Mr. K about a strange room he's found, and wouldn't you know it? Now you're trapped inside, and all you've got to keep you company are a few suits of armor, some fine art... oh, and puzzles and secret mechanisms, of course. To play, just click around and explore! Without anything so fancified as a changing cursor, it's up to you to discover what's interactive and what isn't by combing every surface... seriously, there's some sneaky things going on here. To make progress, you may need to be persistent, or even a little rough, but hey, you don't play an escape game without breaking a few eggs... or... omelets... or... something. Somebody really needs to create a list of escape game proverbs. A Happy Coin in the hand is worth a pixel hunt in the bush... ? Escape from the Knight Room is one of those games that's a lot more complicated than it initially seems. Compared to some of Tesshi-e's previous work it almost looks empty, but you can find yourself stonewalled fairly early on with the codes and tricks you'll be dealing with. Not all of it is intuitive, if only because at least one of the things you're required to do might not occur to you since the item in question doesn't seem to be responding to your attempts to meddle with it, and one puzzle might have you spinning in circles trying to crack its code. On the other hand, the way the game opens up with more layers and puzzles as you progress shows just how good Tesshi-e is at nesting clever puzzles inside your surroundings. While some of Escape from the Knight Room will definitely require you to wake your brain up, once you start piecing the clues together, you can't help but admire how smart a lot of it is. But then... it wouldn't be a Tesshi-e escape if it wasn't, right? Escape from the Knight Room Walkthrough now available! You begin facing a double door. Click for a closeup. Left side has a knocker. Right side has a dial. Click on the dial. You can spin the dial to 8 positions. Click backward. Examine the handles on the doors. There’s a key stuck in the door. Examine the HALF OF A HEART KEY. Back out of the door – one more thing to notice in this view. To the right of the door there’s a space in the wall that looks damaged. Back out and turn to the right. You’re now facing a statue of a knight. There’s a wooden panel to his left and a painting flanked by some wooden frames on his right. Click on the wooden panel, and again on the white panel. There’s a slot in the top. You can use the HALF OF A HEART KEY to wedge it open. Back out and click for a close-up of the dial. Move the dial around in a circle and take note of the letters it reveals. Back out and examine the knight, notice the base to his left needs a handle, but not the CRANK LEVER we have. There’s a series of wooden panels below him, but nothing to interact with. Back out and examine the painting and the two wooden frames. 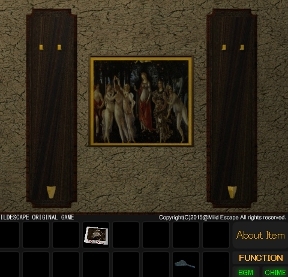 There’s nothing to click, but it looks like something hangs in those two wooden frames. Back out to the full view and turn right again. You’ll notice two wooden chests/benches, a large painting, and a three pedestals. Click the left bench and open the seat. Take the MR BIRDY and notice the marking on the floor of the bench. Back out and try the right bench. The panel under the seat is secured by screws. Back out and examine the pedestals. MR BIRDY fits on the pedestals, but nothing happens in any position. Finally, examine the painting. Predictably, it’s a bit wobbly. Back out and turn right again. You see a similar knight statue (but without the lever switch on the base), as well as two wooden panels. Click the right wooden panel. There’s a hole at the top and a handle at the bottom, along with some spiraled arrows. You can place the CRANK LEVER in the hole, which now spins clockwise and counterclockwise. Click the handle to open the door. You see a metal safe locked with a 3 digit combination and some symbols on the front, Heart – Club, remember this. The NOTE says A+B makes Superglue on one side. Back out and examine the right wooden panel. It’s secured with a padlock. On the circular dial, match the letters from the note to their positions on the dial. Take the MALLET and notice another circular dial like the won on the main door, as well as a small wooden safe with a 3 (Roman) numeral combination. Remember the space in the wall to the right of the door that looked damaged? Try hitting it with the MALLET (click a few times to swing it). There’s a item here, A WINE GOBLET, and a code. Enter the code, back out and click the handle to open the safe. Return to the bench to the right of the wobbly painting. Open the seat and use the SCREWDRIVER on the wooden panel. When you open the panel you’ll see a North arrow facing the First Knight we saw. There’s something else here, so don’t leave yet. Now you can use the KEY to open the Padlocked Panel to the right of the Second Knight. Inside you’ll see a third dial, a second MR BIRDY, and a button. Take MR BIRDY and push the button. Watch the animation where a the knight’s wooden panel opens. Back out, click the wooden panel below the knight and take the A bottle. Rotate the switch and you’ll see a SWORD emerge from the Knight. Back out and click on the Knight, then take the SWORD. Examine the SWORD you just collected. On the back is a code. Use this code to open the wooden safe behind the wobbly painting. Take the third MR BIRDY. Notice that they each have their arms in a different position? The clue from the left bench. Those aren’t Cs, they’re Birdy arms. Use the HANDLE on the First Knight statue – the spot at the base. This releases the second SWORD. Back up and take the SWORD from the knight. We now have two SWORDs, but what do we do with them? The SWORDs should hang in the two wooden frames beside the knight. This opens the panel behind the small painting to reveal a 4th dial, a switch, and a Mr. Hippo with something in his mouth! Flip the switch and you see another panel open at the base of the First Knight. Go there and take the B bottle. Now we have 4 Dials, one on each side of the room. Remember the North arrow facing the First Knight (the side of the room with the SWORDs). Try setting the Dials on each side of the room to correspond with the cardinal positions. Mr. Hipppo is still closed. What else could give us a clue about the dials? Remember the letters in the circular dial? Try setting the dials that correspond to the north arrow to match with the clock position of the correct letter. Mr. Hippo is now open. Take the PLIERS. Use the PLIERS to remove the other half of the Heart Key from the main door. Examine the WINE GOBLET, and pour the A Bottle and the B Bottle into it to form Superglue. Dip the bottom half of the Heart Key into the Superglue, then combine it with the top half of the Heart Key. Use the HEART KEY on the door lock and watch it unlock. You may want to save at this point. Then back up and click the door twice to escape. After you unlock the door, back away from it and return to the circular dial with the letters beside the First Knight. The first thing you should notice is that E is no longer at the 12:00 position, S is. Match the new clock positions of the cardinal letters to the dials in the room. The Second Knight extends his arm and there’s something in his hand. Go to the Second Knight and take the HAPPY COIN! Return to the door and escape! Had a little bit of thinking to do on this one, but not overly difficult. well, I was rolling along nicely and feeling smugly smart. now stuck. Yeah having the same problem as prarielegal. , but I'll be damned if I can figure out how to make the clock dials match up. prairiegal - Is there something in the room that has the compass directions on it? Maybe not in their traditional positions? The circular dial with 8 letters contains the compass points NESW. Match their position on that circle to the location of each dial, relative to the north arrow. Could have sworn I tried that but it worked this time, thanks! Wow, I am having a Monday apparently. Stuck right from the get go. I have a feeling the first puzzle you can solve is the wobbly picture, but I can't seem to find the clue for it anywhere. You are correct, but you need one more item. Check something you wouldn't think to check. I'll be back if I get stuck again. I'm out! But still have no clue how to get the special ending. Anyone has a hint as to where I should look? Do you have both bottles (A and B)? Very neat. I liked the "medievalisation" of some things, like the marble Mr Birdies. It gave it a bit of a different feel, while still being unmistakably Tesshi-e. Wait a second! Half the puzzles in this game are copied from one of Tesshi-e's earlier works, Escape from the Room with No Furniture. SonicLover - you're right about that. I played Escape from the Room with No Furniture not too long ago, and that made this one pretty easy. Some good improvements in this one (the circular letters dial and the back and forth with the knights, especially) that made it enjoyable. Plus there were more puzzles in this one.
. I had to look at the spoiler, confirm I HAD been on the right track, and go back. there does not seem to be any logical sequence to whatever compass points are being used, even with the spoiler. Kind of the opposite of the "ah HA" moments I play escape games for. The directions indicated are not concurrent with the game, but with the N, S, E, W as looking at a clock. Call me dense, but I sure had trouble with setting the dials. Set them to cardinal position? WHAT?? Set them to clock? Where is this clock? This didn't seem as polished as most tesshi-e games to me. Still a fun time, though, and I loved the marble Mr Birdies. Good game, although the lighting was just super moody and dim. "Atmospheric," I think that's called. the knight handed me the Happy Coin -- gasp! Is there someone in there? but, all in all, a very good game. the Happy Coin. I've followed the walkthrough instructions to the letter several times. I've even tried nitpicky stuff like making sure I look in-game at the letter dial before I try, and resetting all the dials to 12:00 before going around the room and setting them to their new called-for positions, and even clicking on the knight to see if that would get him to hand me the coin.